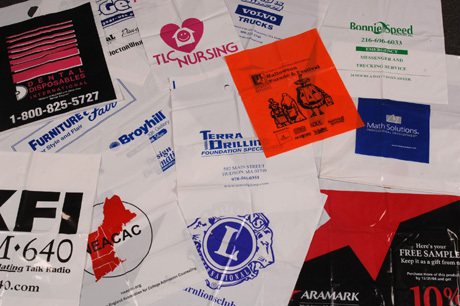 Hudson Poly Bag has been producing Trade Show Bags for our customers for years. When our customer wants the bag to look good, be on time and an affordable price, Hudson Poly Bag has consistently been the answer. We simply do what we say that we will do. Hudson Poly Bag understands that there are two schools of thought when it comes to Trade Show bags. One is to give away an expensive canvas style bag that you bring home and put in your closet or basement “thinking you will use it for a good purpose one of these days”. 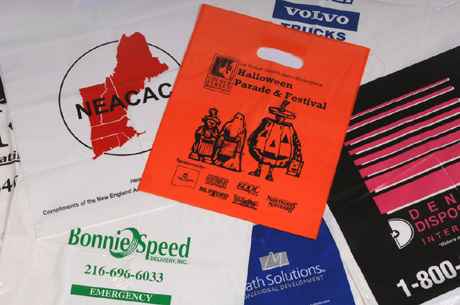 Our customers are more of the school of thought that the Trade Show is so expensive due to the exhibition fees, the cost of the Trade Show booth, personnel time involvement and the service fees required to set it up, that it makes the most sense to have an inexpensive, good looking bag for their literature and samples. After all, it is most likely going to be disposed of shortly thereafter anyway. Hudson Poly Bag can help you with that choice. Our customers provide their artwork and rely on us to make cost saving suggestions that minimize the overall Trade Show expense. And yes, Hudson Poly Bag will manufacture short runs! We will also assist you with converting your artwork into a print proof and printing plates. The printing plates are a one-time purchase; we maintain the plates for as long as you continue to purchase bags from us – at no additional cost to you. Before we start, Hudson Poly Bag will provide a firm quotation, including the printing plate costs and a print proof so you know what the bag will look like. We invite you to discuss with us the various options, so that you can choose what is best for you. Samples are readily available.